Stinger has been labeled for weed control stone fruit orchards for years, and is now labeled for use in apple orchards. The weeds controlled fall into two botanical plant families, composites and legumes. in the tree row and sod row middles. Common composite weeds found in the tree row in New Jersey orchards include Canada thistle and other thistles, goldenrod species, aster species, common dandelion, common mugwort (wild chrysanthemum), horseweed (marestail or stickweed), and ragweed species. Legume weeds include vetch species and clover species. 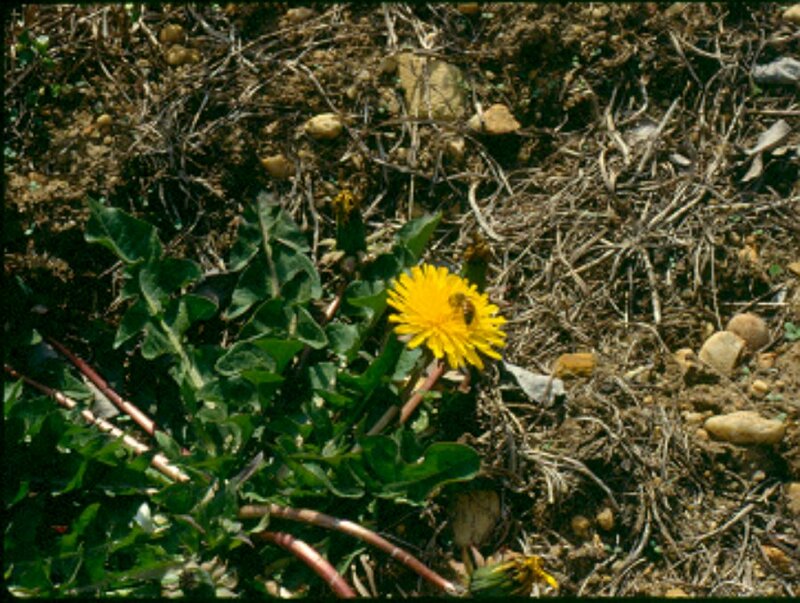 Dandelion and clover are also usually found in the sod row middles. Dandelions and white clover bloom in the spring, but white clover can continue to bloom throughout the summer and into the fall, attracting natural pollinators into the orchard during the entire growing season. The maximum labeled rate of Stinger is two-thirds of a pint per acre (0.25 lb ai/A) per year, in up to two applications, but the rate needed varies, depending on the target species. Tank-mixing with one to two pints per acre 2,4-D will improve control and increase the species of weeds controlled. Two fluid ounces per acre (0.047 lb ai/A) will control seedling annual weeds such as common ragweed, annual vetch, and galinsoga. Three to four fluid ounces per acre (0.070 to 0.094 lb ai/A) are needed to control perennial clover species. Most other susceptible perennial weeds require the full rate of two-thirds of a pint per acre (0.25 lb ai/A). Optimum results controlling deep rooted and hard to control perennial weeds, including Canada thistle, perennial asters, goldenrod species, and mugwort (wild chrysanthemum) will be obtained if the Stinger application is split. Apply one third of a pint per acre Stinger in late April or early May when the weeds emerges in the spring. Some weeds can “survive” for months on established existing foliage even though Stinger suppresses all new growth. Tank-mix with one to two pints of 2,4-D, Gramoxone, or a labeled glyphosate product in the tree row or 2,4-D in the sod row middles to increase the spectrum of weeds controlled and kill existing foliage of perennial asters, goldenrod species and mugwort. Some weeds, especially mugwort, can “survive” for months on established existing foliage even though Stinger suppresses all new growth. Be sure to spray adjacent sod row middles as well as the weed free strip under the trees. Mark the treated rows and repeat the application in 60 to 70 days, even if no regrowth is observed. The first application of Stinger timed to match the emergence of the perennial weed in the spring and coincides with the time of year when the carbohydrate food reserves in the plant are at the lowest point. Treatment at this time reduces the weed’s chance of recovery and survival. 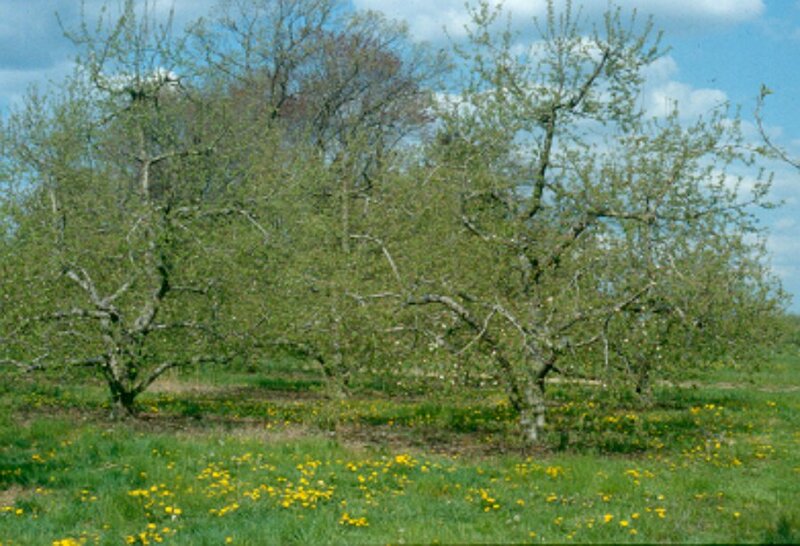 Apply Stinger to the tree row in April when perennial weeds such as Canada thistle and goldenrod are emerging. Apply one-third pint of Stinger per acre to sod row middles in the fall or early spring, BEFORE dandelions bloom. Tank-mix Stinger with 2,4-D when treating sod row middles to increase the the number of weed species controlled. Apply another one-third pint of Stinger per acre to the marked rows, or sections of rows, about sixty to seventy days after the first application. 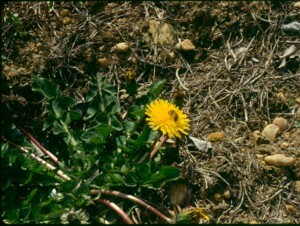 No growth of the target weed should be observed at the time of the second application. Spray the second application even though no growth of the target weed is evident. The second application is essential to the elimination of the hard to kill established perennial weeds. If the second application is skipped, expect to see the weed re-emerge in late August or September. Time both applications to maintain a 30 day PHI (PreHarvest Interval). Stinger is both a postemergence foliage absorbed herbicide and a residual herbicide absorbed by the roots. The initial twisting and curling observed after application to susceptible species is due to the foliar absorbtion. Control of established perennials is due to residual Stinger in the soil which prevents regrowth from the roots. In certain species such as mugwort, Stinger prevents regrowth but does not kill the mature leaves. The plant will survive unless another herbicide such as 2,4-D, Gramoxone, or a labeled glyphosate product is used to defoliate the weed in the tree row, or 2,4-D is used in the sod row middles. Do NOT apply Stinger in a hand held sprayer used to “spray until wet”. Stinger is a residual herbicide that must be applied on a rate per acre basis. When treating “patches” of perennial weeds, apply the recommended rate per acre with a calibrated sprayer. Treat ten to fifteen feet beyond the weed “patch” on all sides. Spray the sod adjacent to the weed “patch” in the tree row.